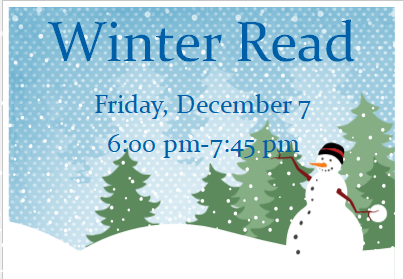 Friday, December 7th from 6:00 pm-7:45 pm is our Annual Elementary Winter Read! This event is free and a great time for the whole family! Wear your favorite pajamas and come listen to a Winter themed story read by teachers, enjoy cookies and hot chocolate, and shop at the Scholastic Book Fair! *Please note that all children must be with an adult at this event.